I will share with you three quick stories and postulate a mathematical definition for us to toast on France’s birthday. It was the summer of 1976. I was a math grad student, researching the potential impact of the 26th Amendment with four other nerds for my senator Birch Bayh. The amendment changed the voting age to match the age when one could be drafted. At the end of the summer, Senator Bayh and his wife, Marvella, took us to a dinner in Indianapolis honoring him. Listening to the speaker that night was, as Frances would say, a defining moment in my life. Robert Greenleaf defined the difference between the servant-leader and the leader-servant. “The servant-leader is servant first. . . . It begins with the natural feeling that one wants to serve, to serve first. Then conscious choice brings one to aspire to lead—leading so one can better serve. “That person is sharply different from one who is leader first, perhaps because of the need to assuage an unusual power drive or to acquire material possessions. . . . Senator Bayh asked how can you identify a servant-first leader. Robert Greenleaf replied: “The difference manifests itself in the care taken by the servant-first to make sure that other people’s highest-priority needs are being served. Robert laughed and said we all know 100% leaders first. He then thought a moment and carefully spoke about the ONE person he had met in his life that he believed was the 100% servant-leader. 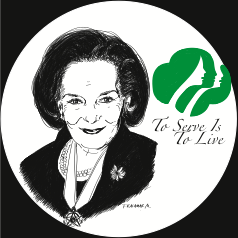 It was the new CEO of the Girl Scouts, Frances Hesselbein. Fast-forward 25 years: In Peter F. Drucker’s living room, I was busy writing down the names of the people Peter Drucker thought I should interview as I wrote about him. When he said, “Frances Hesselbein,” a chill went down my spine. I flashed back to that summer day in 1976. She sees differently and helps others see differently. She sees good and what is possible. She elevates what others are capable of seeing and doing. There are no bounds to what Frances sees. She sees and creates results: the least privileged and all of society benefit from Frances. We are all better off. Frances helps the helping and the helped find more connections and commonality than the differences between them. Peter then went on to link the root of the word spectacles to spectacular and the discussed the history of the words. 2008: My daughter was tutoring middle-school kids at Harlem Children Zone’s after-school program, four days a week. On occasion I would pick her up, and we would drive home together. One day she described her day as taking some donors on a tour. One donor asked if she gave one of their schools a few computers, would that help the kids? Violet’s response: Frances would ask the teachers what tools and support they needed to better serve the students. That morphed into a conversation where the donor asked who was Frances and subsequently contacted teachers at multiple schools to ask the Frances question and better serve the students. The result was glasses for fourth graders who could not read the blackboard in two schools. Spectacles. Frances’s spectacles had gone through my hands to my daughter’s eyes—and to the eyes of the donors to the teachers to serve the students. IT IS A MAGICAL CIRCLE. Every circle has no beginning and no end. What are the properties that characterize the Hesselbein Circle? Every point is equidistant from every other point, meaning each member is equally important. The center, FRANCES, is everywhere. The circumference of the circle is greater than the sum of the members. There are no negative forces inside the circle—all forces are positive. Around every Hesselbein circle another can be drawn. Let us toast to Frances Hesselbein and all Hesselbein circles.